And now we’re going to have a little party. Joining me in this post are my two fashionably with-it roomies, Grace and Ashley, for a group-effort critique of all the swank, the razzle-dazzle, the red carpet flops and floosies of the 85th Academy Awards. Who were the belles? Who were the blunders? Let’s see which dresses are proof that God loves us, and which ones should have stayed in the closet. Gwen: I miss the eye-popping blue she wore to the BAFTAs. Ashley: Yes, the gold matches her skin, but — va-va-voom!!! Gwen: Looks like shredded toilet paper. You know how hamsters chew up stuff to make their nest? Grace: If I were going to the Oscars, I would wear that! Ashley: I don’t know how she sits down, but who doesn’t want to have a dress that big? It’s so fluffy, I’m going to die!!!!!!! We’re agreed: Octavia looks stunning. A very well thought-out dress and beautiful to behold. Gwen: I’m not a fan. Ashley: Eh, I like the top. Grace: I really like that bottom they stuck onto a cocktail dress. Ashley: It’s WRINKLY! Nice hair, though. Grace: Don’t you have a slave who can iron that? Gwen: Or a steamer in the limo? We’re sorry about your leg, K-Stew, really — but you didn’t help by picking a dress the same color as your face and as stiff as your crutches, and honestly, we’re all a little worried about gravity gaining the upper hand here. Grace: She looks like a rock star without being gross. Grace and Ashley: Cleopatra goddess! Or maybe not goddess, but definitely Cleopatra. Gwen: Looks like the shiny, silver, mirror gunk that climbs up Neo’s throat and into his mouth has sprouted on her neck, only it’s gold. Oh, Nicole, your dress. All together now — it looks like an oil spill!!! And guys, your hair shouldn’t look the same. Really? Space-age shoulders? And we’re getting tired of those marathon Vs. Collective dying over here. Ashley: Some people keep saying that she’s over-reaching a little, trying to be all Audrey Hepburn, but you know, if you had a pixie cut and looked that awesome, you would channel Audrey Hepburn too! Gwen: Although it does look like half her neckline shimmied its way down her back. Ashley: And best necklace of the night! Gwen: Except for Jennifer Lawrence. Ashley: It’s a classic red dress. Gwen: Looks like she wrapped the red carpet up under her arms and stood over the heat vent. Catherine is the most gorgeous woman. She can do no wrong. Grace: With her tan, I think it works. Gwen: Her dress looks like the cuffs and collar of a man’s tuxedo extended quite a ways. Grace: Everything about it is so good except for the upper right-hand corner. Gwen: Now that really looks like Neo’s shiny, silver, mirror gunk. Grace: She can pull off the silver. Gwen: Just, whatever you do, don’t sing. Ashley: It looks like two dresses — but the top is a killer dress, and the bottom is a killer dress, so it’s one killer dress! Gwen: But the belt — did you grab that from Old Navy? Grace: She can keep the belt. I’ll take her waistline. Not a fiasco (Reese doesn’t seem capable of fiascos), but this isn’t our favorite for the adorable Southern dink. 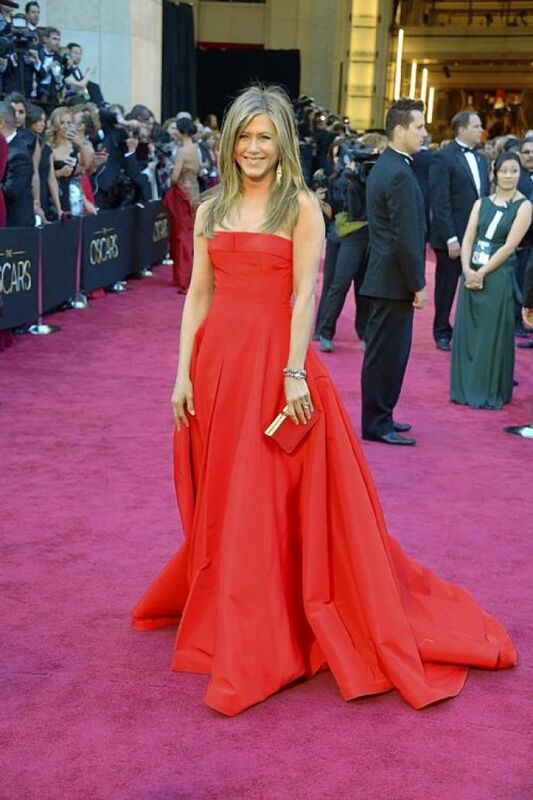 Jennifer’s dress is a giant rose petal, and it’s perfect. Her entire ensemble (hair, pearls, killer blush job that doesn’t look like a killer blush job) is ravishing — and worth every trip.